So what to we know about Sergey Kovalev, the formidable Russian destroyer who challenges Welshman Nathan Cleverly for the WBO World Light-Heavyweight strap at Cardiff’s Motorpoint Arena this Saturday? Known as ‘Krusher’, the 30 year old was born in the city of Chelyabinsk, an ice hockey stronghold, in April 1983. He began boxing aged 11 after following a friend to the gym and knocked up a hugely impressive 193-22 amateur slate which included national titles and international singlets at both junior and senior level. He was the Russian representative at the 1999 European Cadet championships and captured two gold medals at the World Military Games. Twice he was victorious in dual international meets between Russia and the USA. In the summer of 2009, he emigrated to the States to pursue a professional career. Originally, he was coached by the revered Don Turner in North Carolina but, for his last four gigs, he has been schooled by former two division world champion John David Jackson in Florida. In the paid code, the six footer has carved a reputation as a brutal hitter with a punishing jab and a blistering right hand. Of his 21 pro wins, 19 have come inside the distance, (18 within three rounds). On the downside, his CV lists just 57 pro rounds and in the only time he has ventured beyond round seven, Kovalev laboured to an eight round split decision win over Atlanta journeyman Darnell Boone, but he KO’d him in two rounds when they met nine fights later. The solitary blip on his card was a two round technical draw against Grover Young when ‘Krusher’ landed an accidental but illegal blow to the back of the head which left the Memphis man unable to continue. Latterly, there has been a noticeable rise in his level of opposition. Compatriot Roman Simakov had lost just one of 21 prior to tragically conceding his life to Kovalev in December 2011. In his most recent three, New York state’s Lionell Thompson (12-1), Spain’s ex WBA king Gabriel Campillo and Texan Cornelius white (21-1) where all annihilated in three rounds a piece. US promotional giants Main Events and the powerful HBO TV network are now among Kovalev’s benefactors. In search of greater insight and Team Kovalev’s views on Saturday’s big bang-up, boxing writer Glynn Evans caught up with Sergey’s Lithuanian born, English-speaking manager Egil Klimas. What can you tell us about Sergey’s early life back in Russia? Sergey is not from a big family. He has just two brothers. His parents got divorced when he was young and he grew up in poverty in the Ural Mountains; an area of mining and metal ores. All his young life, his diet was just spaghetti and eggs. If he opened the fridge and saw two eggs, that was his day. Then he started boxing at the age of 11 and it was to change his life. Sergey is a product of the Russian amateur boxing program that is producing a string of top pro contenders and champions. Why is it so successful? It’s a historical thing. The Soviets always had one of the best training schools. It’s a very big set-up. Throughout time, they produced a stream of European, World and Olympic champions and the finals and medal tables where usually dominated by the Russians and Cubans. I guess it must have something to do with the quality of the coaching and the vast amount of competitors that they have to pick from. Sergey was already 26 before he opted to discard his head guard and singlet. Why did he decide to come to America and turn professional? Sergey was a part of the Russian national boxing team since 1998 when he was a 15 year old junior. He continued through the mens (seniors) but, though he gave all he could every time, there was a lot of dirty politics involved. He didn’t have much support or sponsorship to push him forward so he sought the professional way. What can you tell us about his personality and character? Between the ropes Sergey is the meanest guy you will ever meet. Some have said he is as mean as Carlos Monzon, Argentina’s great middleweight champion. However, outside the ring he’s a really funny man. He makes a lot of jokes and everywhere he goes, he always makes a lot of friends very quickly. He’s a very good family man, married to Natalya. He has a dog called Picasso and his hobbies are auto cars and travelling. While Sergey’s professional record is statistically very impressive there aren’t too many familiar names on it and there’s a dearth of pro rounds on his CV. Why do you believe that he is ready for a champion as accomplished as Nathan Cleverly? Trust me, because of his amateur credentials which are far superior to this opponent’s, Sergey was ready for this level long, long ago. That was until I ran into Main Events. They gave Sergey one fight and everybody enjoyed what they saw. For his next fight they stuck him on TV. Within a year, HBO are on board and everybody is now raving about him, just as I’d always said they would. Following his 18th contest in December 2011, in Ekaterinburg, Russia, Sergey’s opponent Roman Simakov tragically lost his life three days after the fight, after suffering a brain injury. This must have been very hard for Sergey. Did he ever contemplate giving the sport up? I’m sorry, we never make any comment on that. I fully understand. What have you seen of defending champion Cleverly? Before this fight was set up, we’d never even seen him. Once the fight was signed and scheduled, we began to examine him a lot. He’s tall, enjoys long arms, has some speed and knows how to box. However, Sergey has seen nothing special to scare him. How does Sergey feel about conceding home advantage and having to compete before a large and boisterous Welsh crowd? We’ve heard your Welsh people like to sing, right? Well, Sergey will just pretend that they are singing for him. It will motivate him. He has been in backyards many times. It means nothing to him. Back in the US he was never competing on his own soil, to his own people. After this fight, I’m sure he’ll even have a lot of the Welsh fans on his side. How do you expect Saturday’s fight to materialise? We think that Cleverly will start running very early. Once Sergey lands on him, he’s going to have to chase Cleverly all around the ring. He has every attribute it takes to be considered a good fighter. As well as his power, which is really obvious, he has speed, good movement and perfect footwork. We’re very confident. Believe me, Sergey’s not here for the payday. He’s very hungry for the title and what Sergey wants, Sergey gets! 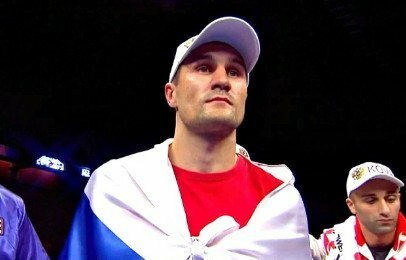 Ultimately, what are your ambitions for Kovalev? When he takes Cleverly’s title, we see him developing into a huge world star. If he could put together a fight for two belts – and Bernard Hopkins’ IBF belt would be ideal – that would be a huge global fight.